DALLAS — "One of the greatest of all time..."
The words reverberated throughout the Staples Center in Los Angeles. February 25, 2019: Nowitzki's final game in Los Angeles. The fourth quarter delivered one of those rare moments in sports when respect and appreciation transcended a game that was still in progress. With 9.4 seconds left, Clippers head coach Doc Rivers commandeered the microphone from the public address announcer. "I was like, 'What the hell is he doing?'" recalled Dallas Mavericks owner Mark Cuban. "Let's go! Let's go!" Rivers demanded to the crowd, as Clippers fans rose to their feet and roared for the Mavericks legend. It was a regular season game between the Mavericks and Clippers, but there was nothing regular about Rivers' salute. "That was sweet," Nowitzki said after the game. "I'm very appreciative." "That tribute was unlike anything I've ever seen or expected," Mavs general manager Donnie Nelson said. "It was one of the coolest things I've experienced." An unprecedented gesture for an unprecedented player. Nowitzki left an indelible mark on the NBA. 14-time All-Star. MVP in 2007. Finals MVP and NBA Champion in 2011. Sixth on all-time scoring list. Highest scoring foreign-born player in NBA history. First European to win the NBA MVP award. Nowitzki spent 21 seasons with the same team, which is also unprecedented. He announced his retirement after scoring 30 points in Tuesday night's home finale. On the court, Nowitzki revolutionized the game. At 7-feet tall, he proved big men could do more than play near the basket. Before Nowitzki, players his height were not expected to shoot 3-pointers or a bunch of mid-range jump shots. "There were power forwards who could shoot some, but none that were shooters first," Cuban said. "In terms of spacing and shooting from anywhere on the court, Nowitzki became the model. The prototype." Shaquille O'Neal made one three-pointer his whole career (on 22 attempts). Not only did Nowitzki become the first power forward/center to win the NBA All-Star Three-Point contest in 2006, but also his one-legged fade-away became one of the most iconic shots in basketball lore. It's hard to block a 7-footer from shooting the ball. It's near impossible when he's fading away. "He redefined a position and changed the way our game is played," states Nelson said. Nelson was one of the key people responsible for Nowitzki coming to Dallas. Nowitzki's career effective field-goal percentage, a stat which adjusts for three-pointers being worth more than two-point field goals, was 51.3 percent — better than the likes of Michael Jordan and Kobe Bryant. Nowitzki proved big men can shoot from deep. Nowadays, most of them do. Young NBA star Kristaps Porzingis is the player often compared to Nowitzki because of his height (7'3") and his European roots. "Dirk is a guy I looked up to growing up," said the 23-year-old from Latvia, after he was acquired by the Mavericks via trade in February. When Nowitzki entered the league in 1998, the NBA only had a few dozen international players. As of opening night 2018, there are more than 100. Nowitzki was not solely responsible for that trend, but his success certainly contributed to it. Off the court, Nowitzki is one of the most beloved players of all time. "A player of his magnitude of greatness, he's twice as good of a human being," Nelson said. LeBron James' respect for Dirk is well-documented. When Nowitzki reached career milestones -- like 30,000 career points and passing Wilt Chamberlain on the all-time scoring list -- game recognized game. What makes Nowitzki so lovable in the eyes of fans, coaches and peers? "He's the kid next door. He's an aw-shucks, lovable human being who has a massively big heart," Nelson said. "He's the guy going to the hospitals and playing with the kids and spending extra time with them," Cuban said. "Volunteering and doing when the cameras off, the same thing he's doing when the cameras are on." Nowitzki and Cuban have spent the last 19 years together, forming one of the closest owner-player bonds in the history of the NBA and, arguably, all of sports. "When you're sitting next to him at a blackjack table...I've been to Vegas countless times with him and there could just be anybody sitting at the table and he'll pull up, 'Ok, this is the spot,'" Cuban said. "Bam-bam-bam. We sit there and there will be two or three other people already there. 'What's up!?' Like they're long lost friends. He'll just sit there and drink and gamble with us for like 12 straight hours and that's just who he is." "Goofy is an understatement," Cuban joked. "I've been kicked out of restaurants with him [laughs]." Nowitzki's sense of humor has made him a must-follow on Twitter. 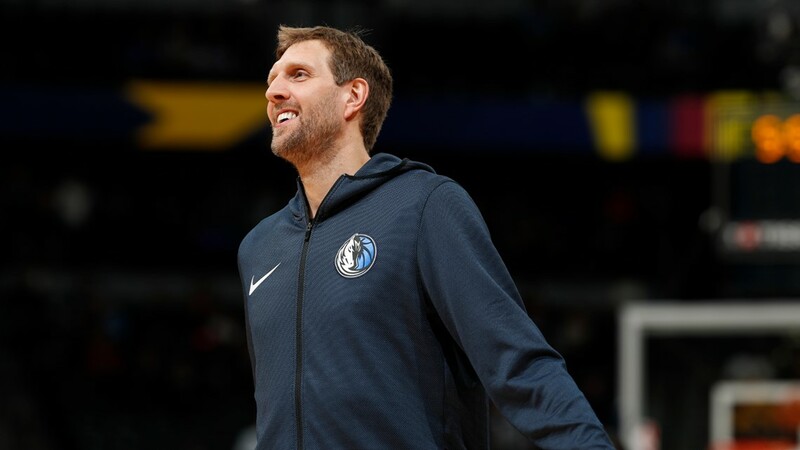 Dirk Nowitzki's 21 seasons with the Dallas Mavericks have graced us with a transformational skillset, one of the most unguardable shots the game has seen in his fadeaway, a majestic decade-long run of winning basketball and a beacon of loyalty. Plus, his acting skills are the stuff of legend. No. 41 turns 41 on June 19, as the husband and father of three begins the next chapter of his life. "It's uncharted territory for him," Cuban said. "Part of him says he's going to travel. Part of him says it's a chance to spend time with his kids and family. Part of him wants to see if his wife will kill him for being around all the time." What does the future hold, besides an enshrinement in Springfield, Massachusetts? "Besides having a statue built of him in front of American Airlines Center, he's going to do whatever the heck he wants to do," Nelson said. "Our hope and expectation is it's with the Mavericks, whether it's management or coaching or development." "For Dirk, I think the best is yet to come," Cuban said. "Because he's so much more than a basketball player." One of the greatest of all time...Dirk Nowitzki.